Like many other video game companies, Ubisoft recently released its full-year sales and earnings report with record financial figures. 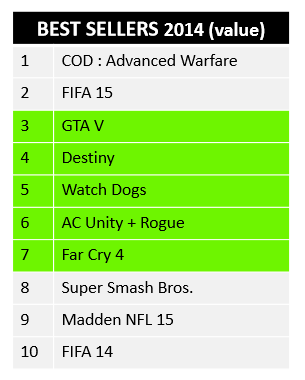 Despite a huge backlash in 2014 from gamers and reviewers regarding glitches and framerate issues, 3 Ubisoft games were ranked in the top 10 best selling games in 2014. These games are Watch Dogs, Assassin’s Creed Unity+Rogue and Far Cry 4. The Digital segment went up and accounted for 26% (€383 million) of total sales vs 19% last year, with digital distribution being the main driver. With 16% of total sales, back-catalog sales remained stable at €233 million. At 77% of sales level, gross profit reached a record of €1,127 million. compared to the 71% (€722 million) of last year. Net income stands at €87 million. Yves Guillemot stated that Ubisoft is expecting stable sales for next year but with “a further improvement in profitability”. This should be possible with the support of the recently announced new entry in the Assassin’s Creed series, Assassin’s Creed: Syndicate, new Just Dance games, a new Rainbow Six game and finally the launch of the highly-anticipated Tom Clancy’s The Division. There’s also another unknown AAA game scheduled for Q4, as seen in the FY15 Earnings Presentation (please refer to slide #15). Digital sales are expected to reach approximately 30% of total sales. So, what is your take on Ubisoft’s plans for the upcoming year? Let me know in the comments.